… it must be time for Project Spectrum! This month the colors are red and pink. I think I have just the right yarn for a few knitting projects. 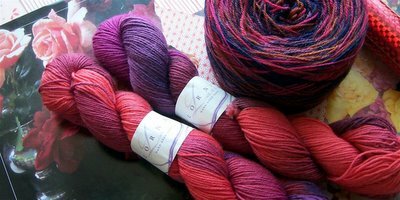 There’s Lorna’s Laces in a color called “Irving Park” and the lovely Schaeffer Anne in, well, a color with a lot of deep pink in it. I’m going to cast on for a scarf in the Anne — Diamond Lace Dress-It-Up from Heartstrings. The Lorna’s might become some lacey socks, but not until I finish the ones I’m working on now — the STR Moss Agate socks that have turned into a stripey pair for one of the exquisite R’s. The other exquisite R will receive a pair of socks that I knitted a long time ago, with no particular feet in mind, but they are just her colors and just her size. I have a few ideas for the Postcard Swap, too. I have a huge folder of pages I’ve ripped from magazines — colors, photos, settings, miscellany — and lots of bits and pieces of paper that I knew I’d want someday. I like to make collages, and I’m still very fond of the big one that I made when Judy and I did The Artist’s Way together (we almost finished the whole thing, and it’s had a huge influence on me nonetheless). My postcard will be a collage, then. So it looks like I’m all ready to start this exciting month of projects. Thanks, Lolly! I wore my Olympic sweater to work on Monday. Not only was I proud and wanted to strut through the store all day, but it was really cold and I actually needed it. At one point I was in the office, and I heard my co-worker J saying to someone up front, “Sixteen days!” I knew just what he was talking about! This was by far the most invigorating knitting experience I’ve ever had. Stephanie’s February 28 blog post says it all. And hey, I’ve made a head start on Project Spectrum, too — my sweater is a full-spectrum extravaganza, don’t you think? Hey there Jane – thanks for all your sweet comments on my blog – such a treat!Are you going to show us a pose of the sweater being worn?? It is so lovely!And you’re already beginning yet another project? whew.. I’m impressed! I’m very excited to start PS this month. It’s time to have some color in our lives as spring approaches! ooooh love the Lorna’s Laces, and the Anne. Am loving everyone’s choices for the red/pink month. And I was trying to knit with something NOT variegated for once, and stick to the solid alpaca red… but now I’m thinking…. Your new sweater *is* a Project Spectrum in itself! So lovely 😉 I am going to make some sockies with the same Lorna’s colorway! They are going to be a birthday gift for my mom! We will be sock-making twins! I *heart* all the colors in your sweater! Can’t wait to see all your Project Spectrum projects. Really beautiful sweater, Jane. I hope your blogger headaches are over soon.